The above is said to have worked for many people already that have read it, it needs to read read every day 100 times morning and evening or more and either blow over the area of pain or blow into cupped hands and rub over body. for then by the leave of Allah NO Harm will come to the reciter inshallah. 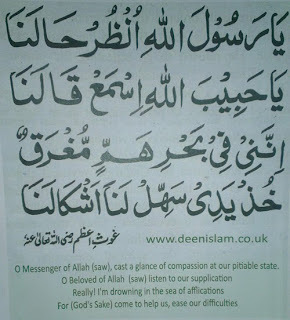 below is the arabic with extra protection duas added on by me Muhammad Sajad Ali. 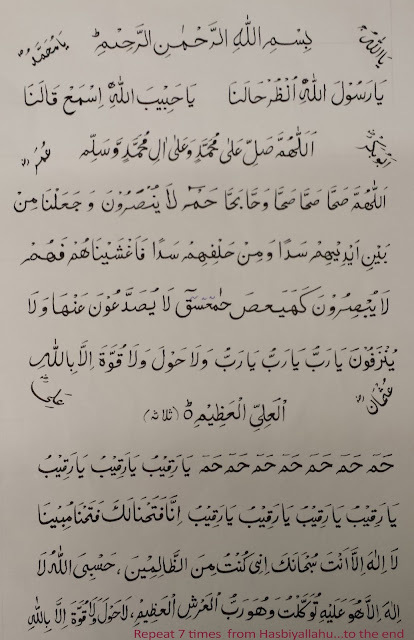 The arabic version has an extra ending adding in by me (Muhammad Sajad Ali) and starting calling in which the Help of the holy Prophet (peace be upon him) is asked upon as given by Shaykh 'Abd al-Qadir Jilani and then ends with 7 Ha-meem ( this is a protection and taken from Hizbul Bahr see link 7 Ha-meem) then 7 Ya Raqibu: Allah is Ar-Raqib: meaning, the Ever-Watchful The Watchful, He who observes all creatures, and every actions in under His control. Ya Raqibu: O Watchful One! Allah's protection is assured to those who invoke this Name seven times, over themselves, their children, their families and their property. Anyone who desires that his family and wealth be protected from destruction and calamities they will be protected by Almighty Allah and will not be destroyed. Ya Raqibu should repeat this Ism each day 7 times and blow on them. He should also continue reading at all times so as to remain safeguarded at all times.Any person who reads this name 7 times for his family members God will alwaysprevent them with all the mishappenings. If recited 7 times on any movable or immovable property or one family members, . This name is also effective for achieving peace of mind and the person will become careful on his/her affairs. If recited on any eatable oil and that oil is applied on boil, it will be cured Insha Allah. If anything is lost this Holy Name is recited 312 times, the lost thing will be recovered Insha Allah. Description: Allah is Al-Raqib, Allah watches over any and everything. This means two things: Allah watched over us so he knows everything about us and because he knows everything about us, he will judge us by what he knows about us. We can’t run away from him or hide from him. This may scare people but the second meaning defines Allah as the one who protects us. The who watches over us to protect us from enemies and ourselves and Allah’s protection can come in many forms. All praises be to Allah Who is known by the Beautiful Name al-Raqib, the All-Watcher. Surely Allah sees and hears all things. He is the One Who sees what is hidden deep in our hearts. He is the One who knows everything, and charges every soul for what it has earned. He is the One Who preserves all that is in creation and regulates it with the best of organisation and the most complete and perfect planning. He is al-Raqib, the All-Watcher, and He is aware of all that we do. Allah does not only watch the bad things we do but the good things we do. Allah knows if we tried our best or not. In High School you can be a top student but if you fail the Exam with a , everything you worked for would be trashed. This is not the case with Allah, Allah sees all the hmwk we do. Allah is Ash-Shura, and appreciative of everything we do. "… Allah is watchful over all things" (33:52). As for line "Inna Fa-tahna laka fath-hum-mubeena". meaning "We have surely given you a signal victory (48:1)" That person will receive a guarantee of safekeeping for the whole year. 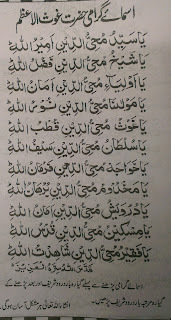 So read it frequently if recitied in Shahr Ramadhan and also hold properties of protection if recited everyday too. Then Ayatul Cream or verse of Distress, and then followed by 7 times 'Hasbiyallahu la ilaha illa Huwa 'alaihi tawakkaltu wa Huwa Rabbul 'Arshil ‘Adheem’ meaning: "Allah is sufficient for me; there is none worthy of worship except He. I have placed my trust in Him and He is Lord of the Majestic ‘Arsh [the Throne]. Hadith says “Allah will grant whoever recites this seven times in the morning or evening whatever he desires from this world or the next." The magnificent phrase la' hawla wa la' quwwata illa' billah is mentioned numerous times in the hadith (sayings of Muhammad peace be upon him) as being highly regarded and highly recommended by the Prophet Muhammad peace be upon him. Allah had ordered His angels to say "La Hawl Wala Quwutta…" in order to be able to carry the throne of Allah which they could not have been able to otherwise. Meaning its power is used to carry problems or burdens of lifes as well as being a powerful protection against enemies. 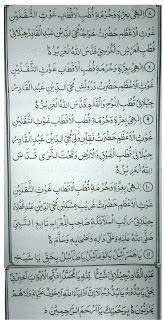 It is also reported that ‘La hawla wala quwwata illa billah is a remedy for 99 ailments/problems, the least of which is sorrow.’ It is a remedy for sorrow because grief mostly occurs when one misses something one loves, or when a distressful thing occurs; and whenever either of these things occurs people perceive their helplessness and inability to achieve their desired aims; hence they feel sorrow. Give Sadaqah without delay, for it stands in the way of problems/calamities."(Tirmidhi). It says 70 problems that is one is shielded from 70 problems with just a small amount of sadaqah. The manner of Shaikh 'Abd al- Qadir's salutation [salam] (may Allah sanctify his innermost being) to the men of the Unseen [rijal al-Ghaib] (sanctified be their innermost beings). 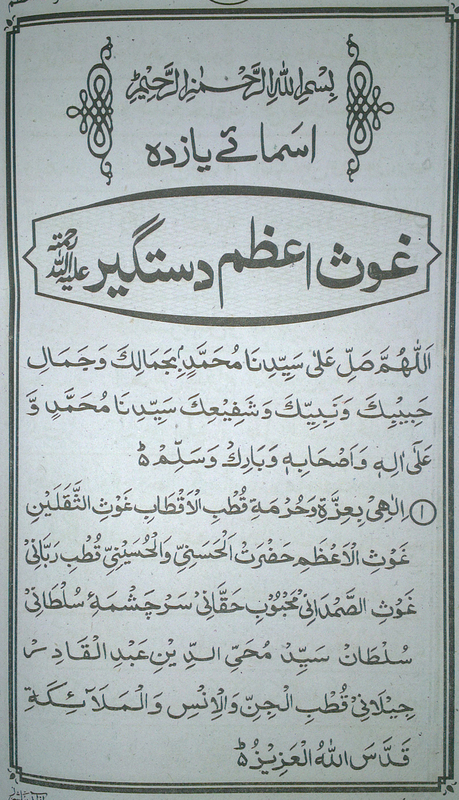 'inda Nabiyyi-na Muhammadin (salla 'llahu 'alai-hi wa sallam). 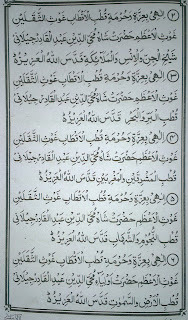 sallama-kumullahu (ta'ala) fid-dunya wal-akhira . O Allah, bestow blessings on al-Khidr! Bismillahir-Rahmanir-Rahim as-salamu 'alaykum ya rijalal-Ghaib. 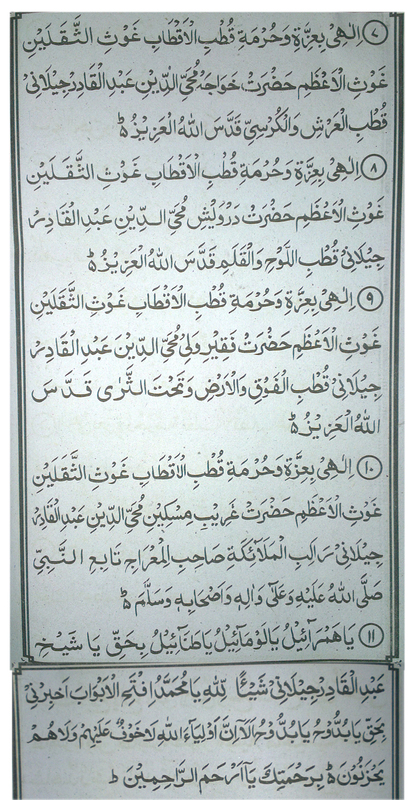 Wa ya arwahul-mutaqaddasa Aghithu-ni bi-ghawthatin a-e-uwni qawwati Unzuruni bi-nazzartin. ya nuqabun wa ya nujabun wa ya budalu wa ya awtadu waya aqtabu wa ya Ghawthu, Aghithu-ni b-hurmati Sayyiduna Muahammad salla 'llahu 'alai-hi wa sallam. until its thirst is quenched. until it is traveled over [lit., "rolled up"]. As for what has come down to us on the subject of the daytime ritual prayers [salawat an-nahar], one item is the traditional report, transmitted on the authority of Abu Salama, according to which Abu Huraira (may Allah be well pleased with him) said: "Allah's Messenger (Allah bless him and give him peace) once said to me: "'Whenever you are about to go out of your place of residence , you should perform two cycles of ritual prayer [fa-salli rak'atain], for they will prevent you from making a bad exit, and whenever you enter your place of residence , you should likewise perform two cycles of ritual prayer, for they will prevent you from making a bad entrance .'" Another Dua is to recite 100 Surah Fatiha and send this reward to the Wali of the country your going to, if one is just going from town to town or city then one Surah Fatiha can be sent to Wali or Pious Ones of that Area location or town/ City you are visiting. This way you are asking help from the Saints and Pious ones of place you feel like stranges in like a new town or city. Ask them for help and blessings once you in the town or City and this way more openings will Inshallah come your way and you we meet more Pious people on any journey. Giving a small amount of sadaqah monthly is continuous giving which is most beloved deed before Allah. Everyday 70 problems come our way and Sadaqah is a shield to protect yourself and your family. The most beloved deed before Allah is that which is continuous, even if it is little. The constant giving of a little is said to please Allah more than the occasional gift of a lot. So if it’s in your means to donate a small amount of £3-£5 or more a month and Support “The Sufi Healing Project” through Uns Foundation. 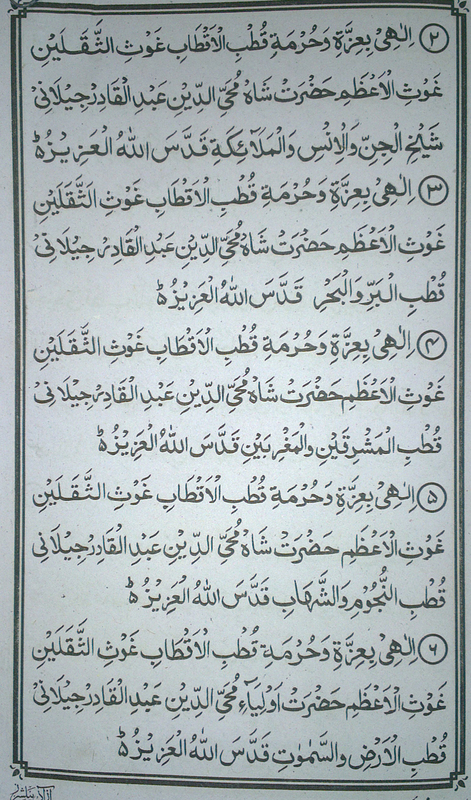 Any one can read the first two duas please ignore the 3rd, the 4th dua is open to all, the fifth Qasidah Ghawiyyah needs ijaza so ignore and anyone can read the last [al-Isti’ana]. either 1,3, 11 times ideally 11 times each for any benefit to happen. That Shaykh 'Abd al-Qadir Jilani implores his grand father the Prophet of Allah peace be upon to gaze this blessed eyes and listen to his call and help due to afflications. 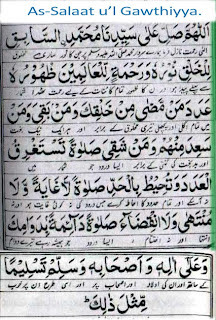 The eminent Chief Helper [Ghawth], Shaykh ‘Abd Al-Qadir Jilani (may Allah bestow His mercy upon him) used to recite this very Durood Sharif upon completing his daily holy practices [Wazifa]. It is stated in the book entitled ‘Mutaliul Musarrat’ that the great honoured Saints have declared that: “Whosoever recites As-Salaatul Gawthiya regularly by day and night, ten (10) times only then Allah (Exalted is He) will grant him nearness [Qurb] and honour at His Divine Court. Upon him, Mercy will descend without measure and he will be protected from all badness. As-Salaatul Gawthiya is a source from the unseen [Ghayb]. Those chosen ones of Allah (Glory be to Him) continue to repeat this. Ten (10) times in the morning and ten (10) times in the evening. This is found in Al-Fuyudat al-Rabbaniyya (Emanations of Lordly Grace) by Al-Baz Publishing, Inc. How ever is called The Wine Ode al-Khamriyya. In their book. But its called Qasidah Ghausia to Indo-pak region of people. The red stars are the rough translations by Aisha Bewley which does not appear in the Baz version. Also the the squence is different from the Baz Version. So Please ask a Shaykh or someon with ijaza before you start reading this Qasida. Shaikh Abd al-Qadir (may Allah be well pleased with him) said: "Countless benefits accompany this ode [qasida] , called The Wine Ode [al-Khamriyya], and its recitation. " It is for the purpose of attracting the Eternal Emanations [al-Fuydat-samadaniyya] by means of the Gilani presence, and each verse is famous for a special property, which makes it unique and able to stand by itself. There are a lot of properties associated with this Blessed Qasidah among them, the person that recites Qasida Ghausia eleven  times every day will be near and dear to Allah. Secondly whoever recites this Qasidah, his memory will be strengthened so much so that whatever he reads or hears he will remember. Thirdly, by reading this Qasidah will be able learn the Arabic language easily. Fourthly, whoever recites this Qasidah for forty days for a particular purpose he will be able to fulfill that. 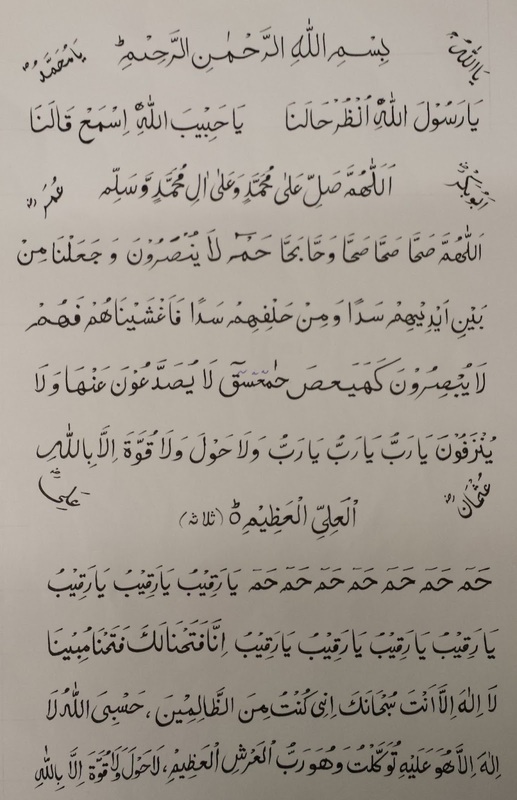 Fifthly, if a person keeps this Qasidah in from of his eyes and reads it three times a day, and if he doesn't know how to read, he listens to it recitation and doesn't separate from this Blessed Qasidah, and has a strong belief and love for what he is listening to or reciting, then he will see Shaykh 'Abd al-Qadir Jilani. 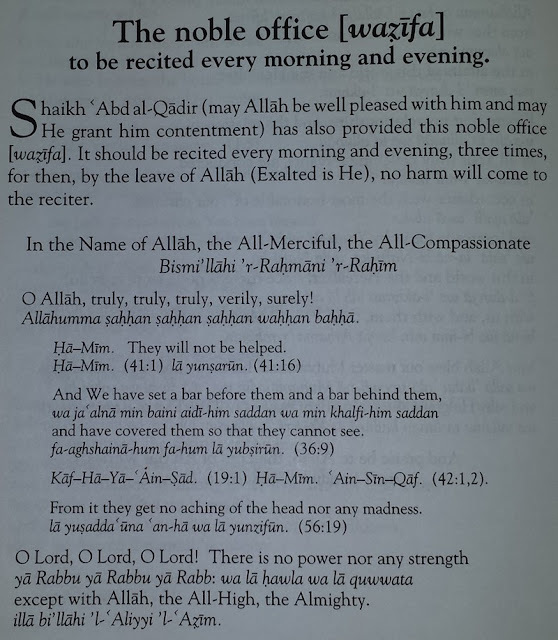 By reciting this Blessed Qasidah, a nisbah-[ spiritual connection] is formed with the sincere reciter and with Shaykh 'Abd al-Qadir Jilani. Shaykh Tahir Alauddin al-Jilani Alayhi Rahma who was amongst the direct descendants of the great Shaykh Abdul Qadir al-Jilani Alayhi Rahma has outlined the rules and benefits of recitation of Qasida Ghausia. This Qasida can be recited for all kinds of difficulties relating to the worldly and spiritual life and is beneficial in solving problems. 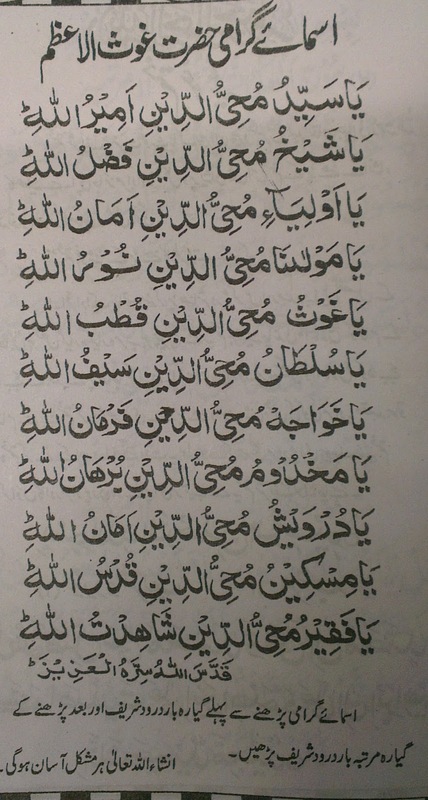 Recitation of this Qasida can also grant a person the vision of Allah Ta’ala and of Rasul Allah Sallallahu Alayhi Wasallam and Awliya Allah as well. One has to possess the correct beliefs, obey the Shariah, who speaks the truth and consumes Halal sustenance. I hope that through the Faiz of Qasida Ghausia one will achieve ones objective for the purposes that one is reciting it for. so I said to my wine: "Come here toward me!" so I experienced ecstasy in my drunkenness among the Masters. at my tavern, and enter, for you are my men! So the cupbearer of the [Lord's] people was quick to bring me sufficient supply. but you did not reach my exaltation and my state of connection. my station is above you, higher still. the Lord of Majesty disposes of me, and He is enough for me! I am the grey falcon of every Shaikh. and who among men has received the same as I! and crowned me with perfection's crowns. invested me with rank and gave me all I asked. so my decision is effective in every case. they would all become a depression in the void. they would be leveled low and disappear among the sands. it would die out and be extinguished by the secret of my state. it would rise up through the power of the Lord and walk for me. pass and go by without my getting news. when to cease from debate. do what you will, for the name is a high one. has given me eminence; I have attained the heights. and the sergeant of bliss appeared to me. before my transformation has been happy for me. as a mere mustard, seed compared to my connection [with Him]. and gained felicity from the Lord of lords. like pearls in the darkness of the night. am in the footstep of the Prophet, the full moon of perfection. for I am a resolute slayer in the fray. and my banners are on the mountain peaks. and my feet are on the necks of men. and my forefather is the very master of perfection. wa jaddi sahibul ‘ainil kamali. Dua also called the Plea for Help [al-Isti’ana]. O Sultan of those who know by direct experience! O crown of the masters of reality! O cupbearer of the spirit! O lamplight of the darkness! O full moon without freckles! O ocean without an edge! ya wasi’a ’l-lutfi wa ’l-karam. O treasury of the realities! O mine of the subtleties! O means of order and progress! ya wasita ’s-silki wa ’s-suluk. O master of kingship and the kings! ya sahiba ’l-mulki wa ’l-muluk. O flower of the souls! O blower of the fragrant breeze! O reviver of the decayed! O law of the nations! O proof of the ardent lovers! O scion of the family of Ta-Ha and Ya-Sin. ya Sulalata ali Ta-Ha wa Ya-Sin. O Sultan of those who reach their goal! O heir of the Selected Prophet! O vault of the mysteries! O displayer of the Beauty of Allah! O deputy of Allah’s Messenger! O heart of the Chosen! O secret of the Preferred! O light of the Approved! O consolation of the eyes! O possessor of the blessed face! O sound in spiritual states! O unsheathed sword of Allah! O fruit of the purely devoted lady [Fatima]! O sympathizer with the people! O source of secret signs! O Ka’ba of those who reach their destination! O means of connection for the seekers! O shedder of luxuriant rain! O benefactor of the human being! O strength of the weak! O refuge of the strangers! O leader of the devout! O best of the worshipful servants! O strong one of the pillars! O beloved friend of the All-Merciful! O revealer of the Eternally Pre-existent Speech! O healing of the ailments of the sick! O most righteous of the righteous! O purest of the pure! O kindled Fire of Allah! O life of the hearts! O guide of the ways! O chieftain of the loved ones! O destination of the spiritual travelers! O noble on both sides [of the family]! O pillar of both parties! O judge of the judges! O opener of the doors that are locked! O sufficient supplier of important provisions! O wall surrounding all things! O light of the council! O fulfillment of hope when the work is done! 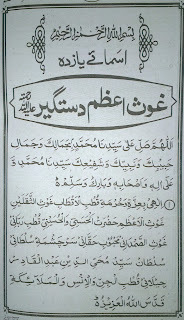 ya muntaha ’l-amali hina yanqati’u ’l-’amal. O chief of the chiefs! O light of the heavens and the earths! ya diya’a ’s-samawati wa ’l-aradin. O dictionary of the preachers! O guide of those who travel by night! O ocean of the Sacred Law! O Sultan of the Spiritual Path! O interpreter of the knowledge of experience! O model of the saints! O support of the poor! O master of splendid spiritual states! O master of compassionate qualities! O master of the clear religion! O master of the Hanbali school [of Islamic law]! O leader of the leaders! O solver of difficult problems! O welcome guest of the Lord of the Gardens [of Paradise]! 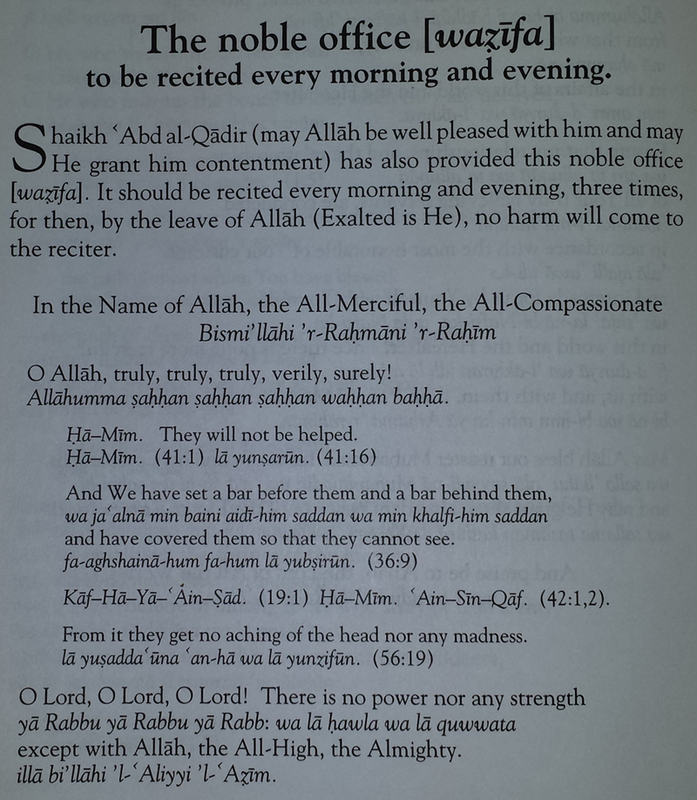 O boon companion of the All-Merciful! O famous native of Jilan! O secret of my God! O champion of the Truth! O Cardinal Pole of the cardinal poles! O satisfier of my needs! O dispeller of my sorrow! O Sultan Muhyi ’d-Din ‘Abd al-Qadir! ya Sultanu Muhyi ’d-Dini ‘Abdi ’l-Qadir. O light of the innermost beings! O He whose secret is manifest in this world and the Hereafter! ya man zahara sirru-hu fi ’d-dunya wa ’l-akhira. O king of the age! O He who carries out the commandment of Allah! ya man yuqimu bi-amri ’llah. O inheritor of the Book of Allah! O inheritor of the Messenger of Allah! (may Allah sanctify his innermost being and illuminate his mausoleum)! (qaddasa ’llahu sirra-hu wa nawwir dariha-h). O Ka’ba of the righteous! O Shaikh of every Cardinal Pole and Helper! ya Shaikha kulli Qutbin wa Ghawth. O witness of all beings at a glance! O observer of the Throne through his knowledge! O traveler to the east and the west with a single step! ya baligha ’l-gharbi wa ’sh-sharqi bi-khatwa. O Cardinal Pole of the angels, the human race and the jinn! ya Qutba ’l-mala’ikati wa ’l-insi wa ’l-jinn. O Cardinal Pole of the land and the sea! ya Qutba ’l-barri wa ’l-bahr. O Cardinal Pole of the east and the west! 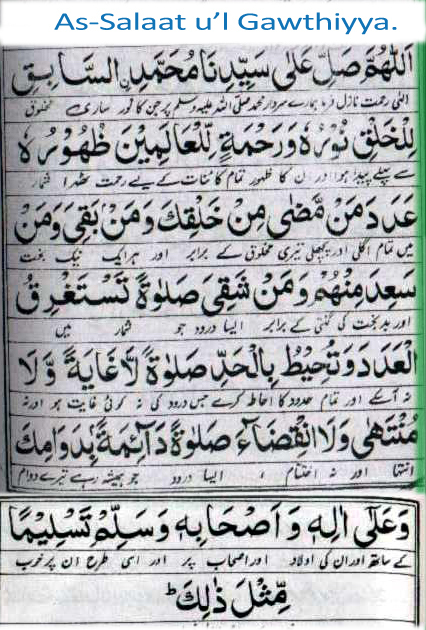 ya Qutba ’l-mashriqi wa ’l-maghrib. O Cardinal Pole of the heavens and the earths! ya Qutba ’s-samawati wa ’l-aradin. and of the Tablet and the Pen! O master of aspiration and of intercession! ya sahiba ’l-himma wa ’sh-shafa’a. even if he is [far away] in the east! wa law kana fi ’l-mashriq. your arrow is on target and your mount is ready to ride! wa sahmu-ka sa’ibun wa rikabu-ka ‘al. O master of generosity and noble grace! ya Sahiba ’l-judi wa ’l-karam. O master of the fine traits of character and aspirations! ya sahiba ’l-akhlaqi ’l-hasanati wa ’l-himam. and in his grave, by Allah’s leave! wa fi qabri-hi bi-idhni ’llah. O master of the foot raised over the neck of every saint of Allah! ya sahiba ’l-qadami ’l-’ali ‘ala raqabati kulli waliyyin li’llah. his spirit and his innermost being. wa bi-shifa’ati-hi wa ruhi-hi wa sirri-h.
and his Companions, and may He grant them peace. except with Allah, the All-High, the Almighty. Please contact me about any questions please or in regards for donating.